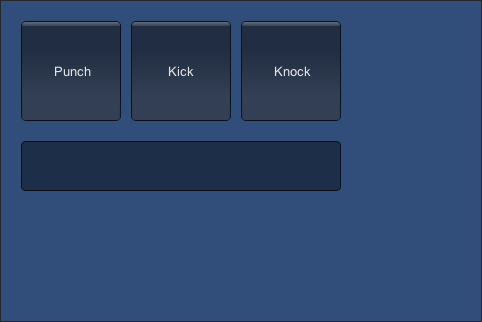 While working on a combo-related project, I stumble upon a problem on how to check whether my inputs can match any of those in my combo library, thus activating the corresponding action. Such as in those action fighting game where you press punches and kicks in a sequence, in order to unlock an awesome combo animation which instantly kills your opponent. Luckily I found a much simpler solution in MSDN, called SequenceEqual() which you could use to compare the contents of arrays and its sequences easily. Now I'm gonna show an example on how you can use this function to do the array checking. 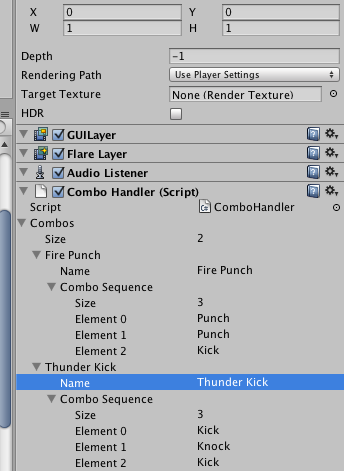 - name: "Fire Punch", comboSequence: "Punch", "Punch", "Kick"
- name: "Thunder Kick", comboSequence: "Kick", "Knock", "Kick"
"comboLimit" => the number of combo sequences you can enter at one time. For default, I set it to 3, because most of the combo sequences I set in part 1, has a size of 3. 8. Press 'Play' in the editor, and you shall see the combo in the works. Fire Punch - "Punch" + "Punch" + "Kick"
Thunder Kick - "Kick" + "Knock" + "Kick"
Even before I learned about SequenceEqual(), there's already something called Equals() and ReferenceEqual(), which according to its description, "helps determine whether the specific object is equal to the current instance". Now I'm not really an IT person, but what I can understand so far when testing with it is that, the Equal() function (which returns a boolean) helps check whether array B is of a clone of array A. If you are comparing array A with a newly created array B, even if you add in similar contents and sequences in it as array A, it will still return a false.